This stew! Oh, this stew! Slow-cooked beef in a flavorful, velvety sauce has got to be one of the most comforting foods around. Add in a mix of hearty root vegetables, that get infused with flavor and become melt-in-your-mouth tender, and you have a swoon-worthy stew! I recently bought a share of meat from a local grassfed beef CSA. We don’t eat a ton of red meat, (not that I have anything against it!) so I’ve been using it up slowly. Grassfed meat is special! These days, I would rather have a lifetime supply of grassfed beef over a lifetime supply of Sprinkles cupcakes. Who have I become?! I can’t decide what I love more about this stew, the fall-apart, tender beef or succulent stewed vegetables. We savored every spoonful! I served it with homemade, whole-grain dinner rolls (gluten-free, of course) and a big green salad. I could eat that meal everyday and be a happy girl. After the meat has been cut into chunks, heat 1 tablespoon of oil in a large skillet over medium-high heat. Add the beef in 1 layer (probably about 1/2 the meat) and brown on one side without moving for 5-6 minutes. 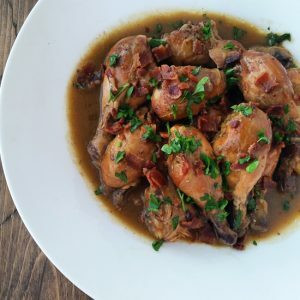 Browning the meat adds so much flavor the to final stew, so don’t skip this step! Put the browned meat in the slow-cooker and repeat with the remaining meat, adding more oil to the pan if necessary. Keep as much fat in the pan as possible when moving the meat over. Do not clean the pan. With the pan on medium heat (adding more oil if needed), add the onion and mushrooms and saute until softened, about 5 minutes. Add the garlic and cook for 30 seconds. Add a cup or so of the beef broth to the pan and scrap all the brown bits off the bottom of the pan (yummy flavor!). Pour the broth/onion mixture into the slow-cooker. Add the remaining beef broth, bay leaves, tomato paste, soy sauce, and russet potato to the slow-cooker. Cook on low for 8 hours or high for 6 hours. About 2 hours before the soup is done, add the carrots, parsnips, and yukon gold potatoes and give the soup a stir. Continue cooking until the vegetables and meat are tender. If you need to add all the vegetables at the beginning of the cooking time that will work too. They might just fall apart a little more. Mix together the arrowroot powder and water in a small cup. In a glass measuring cup, scoop out about 1 cup of the hot broth, While whisking, pour in the starch mixture into the hot broth and whisk until smooth. Add the broth back to the slow-cooker and stir to combine. Remove the bay leaves before serving. Season to taste with salt and pepper. Enjoy! *I like to chop the mushrooms very small so they melt into the sauce and give it great flavor. 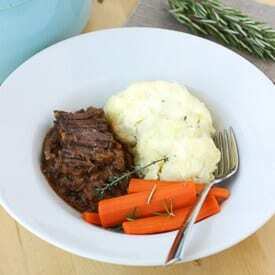 *The russet potato is meant to help thicken the stew, which is why it’s added in the beginning of the cooking process. Novice cook here. You brown only one side of the beef? 2 hours for the veg on low or high heat? Does this fit a 4 qt crockpot or is yours a 6qt? Great questions! You can brown the meat on both sides if you like. I think a really good brown on one side is enough for this stew. The vegetables will be fine on either low or high. You can reduce it to low if you were cooking it on high if you like. I have a 6qt, but this should fit in a 4qt as well. I hope this helps! Let me know if you have any more questions. 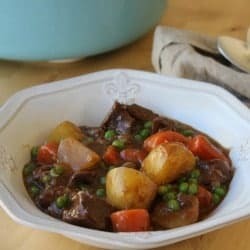 I love beef stew, and was hopeful this would be delicious. I made it last night and it was average. It’s lacking some flavor in my opinion…herbs? Salt? I’m just not sure. My quest for flavorful, Paleo compliant stew continues.